Men are Criminalized for everything. We're slowly being coaxed into losing our ability to make friends, find partners, bond into communities or just merely being able to hold a conversation without the aid of technology. Do it the old way = creepy guy. The worst part is that most people taking part in creep-shaming, do it voluntarily. confronted her after he was asked to leave the premises. To be fair, the reason he appeared in court might be that "confronted" the woman who he allegedly winked at initially. The article did not give enough details about that case. 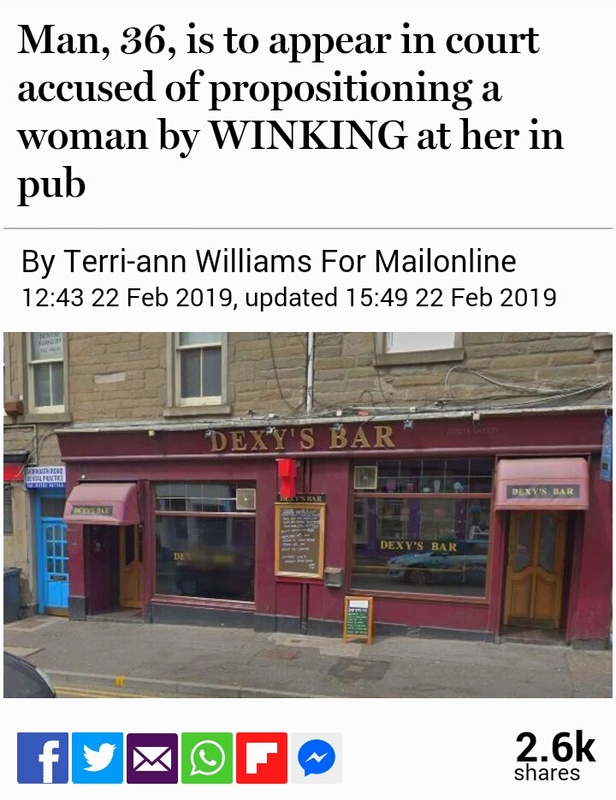 He may not have actually winked at the woman. Also, the article did not indicate how did he "confront" the woman. Did he want to convince the woman to not think that he is a creep? Or did he wanted to just say something to the woman to get it out of his chest before leaving? Was he upset by the woman? Did he just wanted to ask her a question to make sense of it? Did he apologize to the woman but the woman perceive the apology as confrontational? Do anything out of the norm, you're judged to be unstable or threatening. It is "not normal" to wink at anyone. It is "not normal" to "confront" a woman. It is "not normal" for an man to send to send a friend request to woman on social media unless he interacted with her in real life. It is "not normal" to interrupt a female cashier doing her job by going up to her and saying "I love you" to her. It is "not normal" to walk next to a woman who do not know you. It is "not normal" to sit right next to a woman who does not know you, where there are a lot of other empty seats. Doing things out of the norm (unless it is obviously a joke or social experiment) may lead to the perception that you lack social awareness of boundaries; i.e., a "weirdo" or "creep". People might think "What else would he do? Would he physically harm me?" This is the reason why women feel scared of or uncomfortable by "not normal" behavior. Soon, it might be "not normal" to approach a woman in real-life because of the popularity of technologies like dating apps. Men are slowly being coaxed into losing our ability to make friends, find partners, bond into communities or just merely being able to hold a conversation without the aid of technology. Do it the old way = creepy guy. If a man denies that he is a creep, it would be impossible for him to convince her that he is not, unless he has mutual friends who could help him convince her. Whether people view you to be creepy or not is a question that depends how much they trust you and there is no way to gain their trust by confronting them; obviously no one is entitled to anyone's trust anyway. If he was facially attractive and well-dressed, and he winked at her in a non-serious, jokingly way, the woman might not have reacted so negatively. People judge attractive people differently. Attractive people are perceived to be socially adjusted; one of the reasons is because they are assumed to be experienced with women. Attractive people are not seen as stalkerish or clingy because they are assumed to have options. Attractive people are not seen as pushy or overly-persistent because they are assumed to be red pilled that looks matter much more than what you say or do; the amount of talking will not change your attractiveness by much. Abnormal or awkward behavior coming from an attractive man might be more easily explained away. But abnormal or awkward behavior coming from an unattractive man will more likely be a red flag to her. Many women did not want to enter into relationships with unattractive beta males because they are afraid that they might be creeps, stalkers and weirdos who might harm them given the right circumstances (like during a break-up). This is one of the reasons why more women are remaining single.